We all know that germ-ridden supermarket carts have maimed and killed millions of children. In fact, it’s a wonder any of us survived those childhood trips to the supermarket. Fortunately those days are behind us. 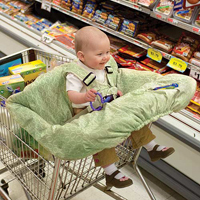 The Protecto Shopping Cart Cover takes our children out of microbial harm’s way so we can focus our worry on pedophiles and nut allergies. The Protecto is no more cumbersome than a large comforter, and no more embarrassing than shuffling through a town assembly with your pants around your ankles. Best of all it assembles in less than an hour, so it won’t detract from Purell and Clorox shopping expeditions. 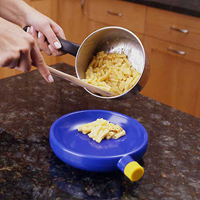 It used to be that when food was too hot to serve to your child you’d have to wait for it to cool down. And wait. And wait. Sometimes up to 2 minutes. With Mr. McCool, your waiting time is cut in half! Using patented put-this-in-the-freezer technology, the Mr. McCool actually turns cold when put in the freezer. Put hot food on it and it cools down. It’s like having a cold plate but it’s plastic and can’t go in the dishwasher. “Mommy? Can you put my juice box in a plastic container?” No doubt you’ve lost track of how many times you’ve heard that. Until now, children were expected to simply hold on to their juice boxes as they drank from them – like animals! 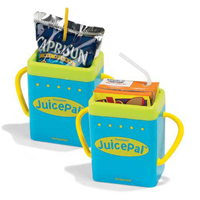 Juice Pal holds your child’s juice box in a non-disposable plastic container, giving you something to carry around everywhere while at the same time allowing your child to avoid holding an actual juice box. We’ve all heard horror stories about children who drop spoons on the floor. That trauma is a thing of the past with Tetherspoon! 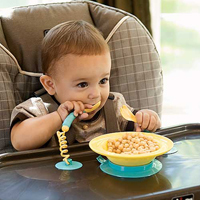 By affixing your child’s spoon to the table the Tetherspoon prevents unpleasant spoon droppage, while at the same time teaching him that utensils are awkward to use because they’re affixed to the table. Soon, the holocaust of popsicle drippage will be but an unpleasant memory thanks to Drip Catcher. 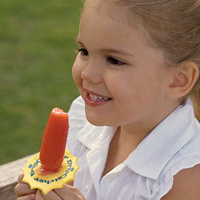 Simply attach to your child’s frozen treat and watch as the compressed sponge catches and absorbs every naughty drip! When your child is finished simply throw the drip-soaked sponge in a landfill and forget the whole thing ever happened, leaving your humiliated child’s shirt delightfully stain-free. All Crazee Mommy purchases come with Kneepadz to protect your child in case he accidentally crawls.